Do you have a minute to spare to learn some English? James will help you judge when to use actually and when to use at the moment. Give us 60 seconds and we'll give you the English! At the moment, I'm making this programme, but actually, I should be in a meeting. So this sentence shows both phrases but they're actually quite different. Let's break it down. At the moment, I'm making this programme. As you can see, I'm making this programme right now, so at the moment means 'now', or 'in the present'. But actually I should be in a meeting. Now in this part of my sentence, actually isn't talking about time at all. Actually means 'in fact' or 'in reality'. So, if you want to talk about now, say at the moment. But if you want to say in reality say actually. At the moment I want to go and make a coffee, but actually I think I'll go back to my desk. Bye! Actually means 'in reality' or 'in fact'. It is often used to present information which contrasts with what is believed to be true. I thought I had got the answer correct, but actually it was wrong. Many people think it always rains in the UK. Actually, it only rains most of the time. The police are unclear as to what actually happened. At the moment means 'now' or 'in the present'. I'm studying at the moment because I have an exam tomorrow. I'm sorry. He's not here at the moment. Would you like to leave a message? At the moment, They're renovating their new home so they don't have any spare time. 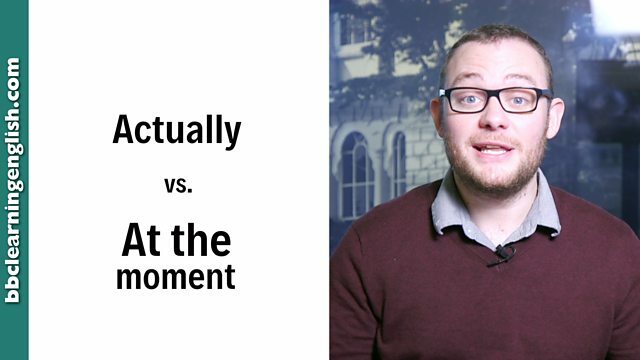 Does 'actually' mean 'now' or 'in reality'? Which of these does NOT have the same meaning as 'actually'? Does this person mean 'now'? If so, why is the sentence in the past tense? Complete this sentence with the correct word: I thought his car was red, but ______ it was blue! Are we talking about a contrast between what's believed and what's real or something happening now?